NowNow is a service that mobile users can use to find answers to any question via mobile email. 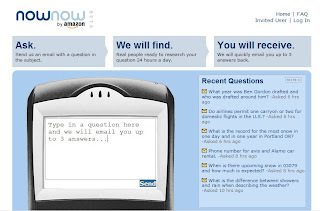 When you post a question to NowNow via email (ask@nownow.com), NowNow workers will surf the web to find the answer for you. NowNow built by Amazon, it is free while its beta running now, but you must register with Amazon.